The small island of Pinta is located in the North of the Galapagos archipelago. One of the 11 remaining races of the Galapagos Giant Tortoise (Geochelone elephantopus abingdoni) comes from Pinta, but their history is a tragic one. Whalers and sealers heavily depleted their numbers in the 19th century, some ships taking many tortoises at a time. The tortoises were a good food source as they could live up to a year in the holds of the ships without food and water. Females were generally taken first as they are much smaller than the males and could be found in the more accessible lowland areas during the egg laying season. Before Lonesome George was found, the last reported sighting of tortoises on Pinta was in 1906, when the island was visited by the Californian Academy of Sciences. They collected three males, which were the last tortoises seen on Pinta for the next 60 years. Another issue for the Giant Tortoises of Pinta Island was the presence of goats, which were released by fishermen in the 1950's as an alternative food source. These introduced mammals destroyed much of the vegetation and directly competed with any remaining tortoises for food. The population of goats grew rapidly, devastating the vegetation and causing erosion. In 1971, National Park wardens hunting goats on Pinta came across a single male tortoise. He became known as "Lonesome George". His name derived most certainly from being the only surviving example of his species and "George," after the U.S. actor George Goebel, who called himself "Lonesome George" in a television program. It was decided to bring the animal back to the Charles Darwin Research Station, where there was already a captive breeding program for the giant tortoises. Many years later, "Lonesome George" was placed in a corral with female tortoises (Geochelone elephantopus becki) from Wolf Volcano, located on Isabela Island. The hope was that by placing these animals together, the Pinta race through "Lonesome George" would pass along at least some of his genes into future generations. The Wolf race were the closest morphologically to the Pinta race. The aim was to maintain George's sexual activity for the possibility that a Pinta female was found, or at least back crossing to create as close an offspring as possible to the Pinta characteristics. Unfortunately, he has yet to succeed in breeding successfully with these females, and we do not yet fully understand the reasons. "Mounting" took place, but no eggs resulted. This could be because of the genetic distance between George and the tortoises of Northern Isabela. Scientist Edward Lewis has made DNA scans of tortoises all over the world without finding a match. George's diet is being investigated to ensure there is no deficiency that could be causing his failure to reproduce. We have considered the theoretical possibility of cloning lonesome George, manipulating the gender of the clone, and trying to produce a female. This is theoretically possible, but practically very difficult, and the technology for cloning of tortoises has not yet been developed. Before we attempt cloning of Lonesome George, we feel we must exhaust all other possibilities first. There is the possibility that other tortoises could exist on George's native island of Pinta. Young tortoises are very small and secretive, and any young tortoises present when George was removed from Pinta would most likely have been overlooked. These tortoises would now be adults and technically easier to find, except that the vegetation of Pinta has responded vigorously to the removal of goats (which were previously destroying this vegetation.) The island is now very hard to get around, and a major campaign must be undertaken to systematically cover the island and definitively conclude that there are no remaining Pinta tortoises to use as a mate for Lonesome George. If our efforts are unsuccessful, when "Lonesome George" eventually dies, his race ends with him, and will join the other races of giant tortoise that have become extinct in the Galapagos. Heavy depredation by humans was the problem in the past. Today, one of the biggest problems facing the endemic Giant Galapagos tortoise is that of introduced species. The National Park Service and the Charles Darwin Research Station have eradicated the troublesome goat from Pinta. Many of the native plant species have recovered. 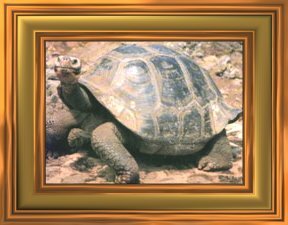 There is hope for the recovery of Pinta as there is hope that one day we will find a mate for "Lonesome George" or another Pinta tortoise. If we can find a mate for Lonesome George, we'll be a long ways towards restoring the ecology of one of the most fascinating Galapagos Islands. Current data about "Lonesome George"